This is your quick guide to the main airports in Japan. Share and bookmark it so you have it handy for your next adventure in Japan. For more travel guides and deals, follow us on our Telegram channel. Haneda has 3 terminals: terminals 1 and 2 handle mostly domestic flights (from JAL and ANA), terminal 3 handles international flights. This is one of the two major airports in the city of Tokyo. Haneda Airport is also known as the Big Bird, being able to service millions of passengers annually with quality domestic and international flights and more. Train – Keihin-kyuko (Keikyu) Line goes to Tokyo, Shinagawa, Asakusa, Yokohama, etc. Travel to Tokyo takes about 30 minutes (580 yen) and to Shinagawa takes about 16 minutes (410 yen). Monorail – The Tokyo Monorail goes directly to Hamamatsucho in the south of Shinbashi district) and central of Tokyo area. Travel takes about 20 to 25 minutes (490 yen). Limousine Bus – One-way journey takes around 40 and 55 minutes (930 yen). Shuttle Bus – A free airport shuttle bus connects the International Terminal with Terminals 1 and 2. Taxi – Taxi stands are located on the first floor of each terminal (5,000 to 11,000 yen). Car Rental – Rental stalls are available in Terminals 1 and 2. Click here for the Haneda Airport map. Narita has 3 terminals: terminals 1 and 2 have a railway station in their respective basements. Terminal 3 handles low-budget airlines. Most tourists land and depart from Narita Airport for it is the biggest international airport in Japan. With that said, there are multiple ways to get to and from it. Skyliner – Keisei Skyliner Access Express reaches Nippori Station in 40 minutes (2,470 yen). The next transfer, the JR Yamanote Line or JR Keihin-Tohoku Line to Tokyo Station takes about 10 minutes (160 yen). Tickets can be bought on the B1 floor of the terminals. Tourists can also purchase online or from travel agents for only 2,200 yen. JR Narita Express – A Tokyo Round Trip Ticket provides tourists with a discounted round trip between Tokyo and Narita Airport within a 2-week period (4,000 yen). One way tickets are also available (3,000 yen). Travel takes around an hour. It is also included in the Japan Rail and JR Tokyo Wide Area Passes. JR Sobu Line – This is the cheaper alternative to JR Narita Express. One way travel to or from Tokyo takes 90 minutes (1,320 yen). Keisei Limited Express – From Narita Airport to Nippori Station takes about 75 minutes (1,030 yen). Transfer to JR Keihin-Tohoku Line or JR Yamanote Line for Tokyo Station; the trip takes around 10 minutes (160 yen). Airport Shuttle Bus – Narita Airport provides free shuttle bus service between 5 am – 10:30 pm. Access Narita Bus – This is a discount bus service that operates between Narita Airport, Tokyo Station, and Ginza Station (1,000 yen for day trips, 2,000 yen for late-night trips). Advance reservations are recommended. Airport Limousine – The highway express bus heads to central Tokyo and Tokyo City Air Terminal. It takes about one and a half hours in light to moderate traffic. Car Rental – Rental stalls are located on the first floor of the terminals. Taxi – Taxi bays are located on the first floor of the terminals. Click here for the Narita Airport map. Distance from the city: 2.6 km from Hakata Station (biggest train hub in Kyushu), 4.6 km from downtown Tenjin district. Fukuoka has 2 terminals: a domestic and an international terminal. The terminals are connected by a free shuttle bus. Fukuoka Airport is both a domestic and international airport. It is the fourth busiest airport in the country and is the primary airport of Kyushu. The Domestic Terminal is spread out over three long buildings. It caters to passengers with major Japanese and budget airlines. The International Terminal, on the other hand, is in a separate building across the runway. Passengers from the Domestic Terminal can reach it via the free airport shuttle. Subway – Fukuoka Domestic Terminal is 5 minutes or 2 stations away from Hakata Station (260 yen) and additional 3 stations or 12 minutes from Tenjin Station (260 yen). Nishitetsu Bus – This is a local bus that services to and from Hakata Station. One way travel takes 15 minutes (260 yen). Taxi – Hakata Station is 10 to 15 minutes away from the airport (1,200 yen). Click here for the Fukuoka Airport map. Kansai International airport has 2 terminals. Terminal 1 handles both domestic and international flights. Terminal 2 serves low-cost airlines. 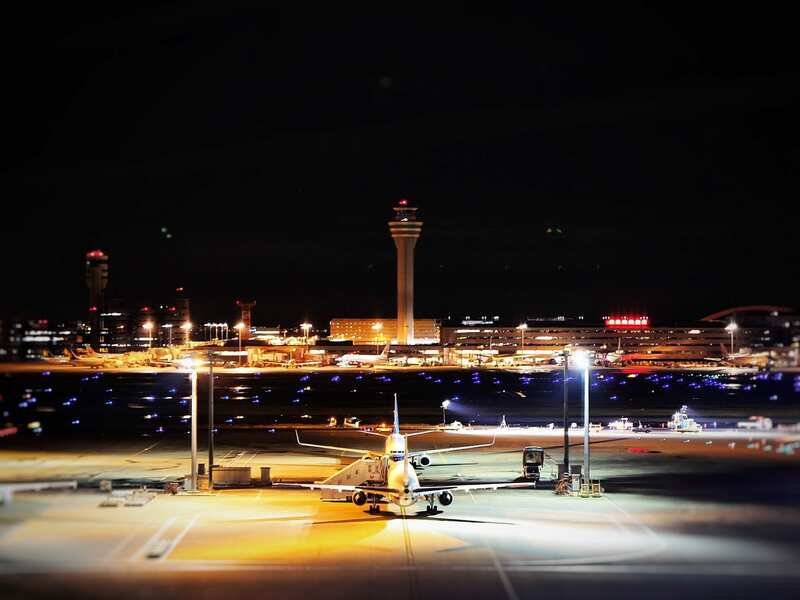 Also known as KIX, Kansai International Airport is one of Japan’s most important international airports. Terminal 1, the main one, serves international and domestic flights with regular airlines and has train service. Terminal 2 serves with low-cost airlines and is connected to Terminal 1 via the free airport shuttle. JR Haruka Limited Express Train – This trip goes directly to Shin-Osaka Station in 50 minutes (3,000 yen – reserved seating, 2,330 yen – unreserved seating) and to Tennoji in 30 minutes (2,200 yen – reserved seating, 1,710 yen – unreserved seating). The Icoca & Haruka Ticket is offered to tourists and allows purchasing of an unreserved seat (1,100 yen to Tennoji, 1,300 yen to Osaka – with Icoca Prepaid Card). Rapid Train – Rapid train travel to or from Osaka Station takes about 70 minutes (1,190 yen) and to or from Tennoji about 50 minutes (1,060 yen). Nankai Railways Limited Express Train – It takes about 35 minutes between the International Terminal and Namba Station (1,430 yen, reserved). Nankai Railways Express Train – This takes a little longer: 45 minutes between Kansai Airport and Namba Station (920 yen). Note: If you’re transferring to another subway line at Namba Station, purchase the Kanku Chikatoku Ticket (1,000 yen, Nankai train fare plus subway train fare). Limousine Bus – The one heading to and from Osaka Station takes about an hour (1,550 yen); the one to and from Namba Station takes about 45 minutes (1,050 yen). Click here for the Kansai International Airport map. Distance from Osaka: 10 km. Itami has 1 terminal and serves domestic flights, mostly from JAL, ANA and IBEX Airlines. The airports’ name change can be attributed to the opening of Kansai Airport which now handles international flights. With that said, Itami Airport now serves domestic flights only. Monorail and Train – The Osaka Monorail from the airport to Hotarugaike Station takes 2 minutes (200 yen). The next transfer, Hankyu Takarazuka Line to Umeda Station takes 15 to 20 minutes (220 yen). Take the same route going back to Itami Airport. Bus – Bus trips to Umeda Station take 25 minutes (640 yen), to Shin-Osaka Station 25 minutes (500 yen), and to Namba Station 25 minutes (640 yen). Ferry – A high-speed ferry connects Itami airport with Kobe Airport, an island airport off the coast of Osaka Bay. Car Rental – Rental stalls are located at the airport. Taxi – Taxi stands are present in all terminals. Click here for the Itami Airport map. Distance from Nagoya: 40 km. It is considered as a first class airport and serves as a main international gateway for the Chūbu region in Japan. Chubu Airport – “Chubu” means “central Japan”. Additionally, Chubu Centrair International Airport has more domestic line services compared to Narita and Kansai Airports. If you’re aiming to visit the small or medium cities in Japan, it is better to come to this airport. Meitetsu Train (Nagoya Railroad) – A one way trip between Nagoya Station and Chubu Airport takes 30 minutes (870 yen – unreserved seating, 1,230 yen – reserved seating). Direct connections to Inuyama and Gifu City. Note: The Japan Rail Pass is not valid on Meitetsu Trains. MU Sky Limited Express Train – First class reserved seating is the only available option (from 360 yen). Tickets can be purchased at ticket vending machines at the train stations. The earliest purchase allowed is a month prior to boarding date. Tokkyu or Limited Express Train – This is the same as the MU Sky Limited Express Train but it carries both reserved and non-reserved sections. Car Rental – Rental stalls are located on the first floor of the airport. Taxi – Taxi rides to central Nagoya (12,500 yen) are located on the first floor of the airport. Meitetsu Bus – Bus rides going to and from Nagoya, Aichi Prefecture, and other local locations are available. One way ride takes 45 to 85 minutes, depending on where you get off (1,200 yen). Click here for the Chubu Centrair International Airport map. New Chitose airport serves a few international flights and several domestic routes, including the busy Tokyo-Sapporo route. This is the main airport of Sapporo, Hokkaido, and is the most preferred air route when travelling between Tokyo and Sapporo. New Chitose Airport JR Rail Line – This heads to and fro the different cities in Hokkaido. The station is located at B1F of the Domestic Terminal. Rapid Airport Express – This, as well, heads to and fro the different cities in Hokkaido. The station is located at B1F of the Domestic Terminal. Bus – Bus terminals are located on the first floor of both the Domestic and International Terminals. For more specific services and costings, you may proceed to the bus counters present at the Domestic Terminal Building. Car Rental – Rental stalls are present on the first floor of the Domestic Terminal. Taxi – Taxi stands are available at both the Domestic and International Terminals. Click here for the New Chitose Airport map. 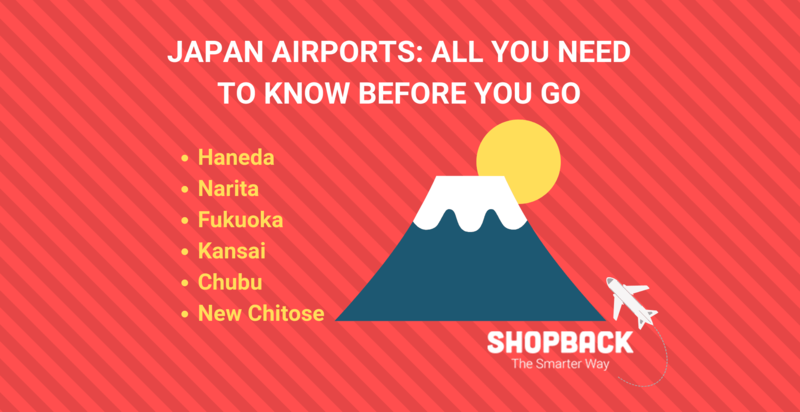 There you have them — Japan’s major airports and the important bits you need to know. May this be a helpful guide to you and your travel. Enjoy Japan! Was this article helpful to you? What other details would you like to read on our travel posts? Let us know in the comment section below! We’d love to read from you. Disclaimer: The prices presented in this article are as of the writing date. 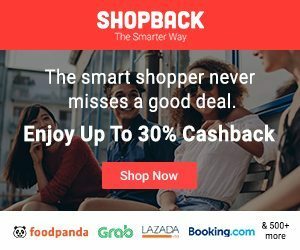 Should I Get Pocket WiFi Or A Local SIM Card In Japan?